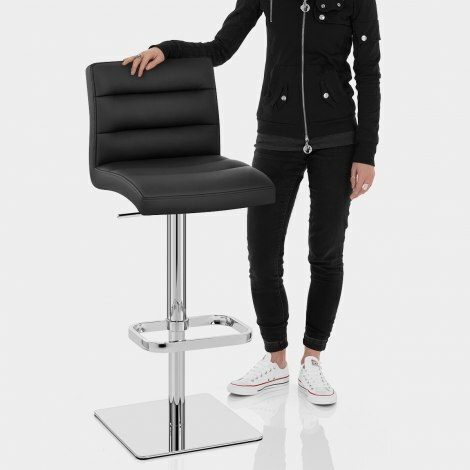 The Lush Real Leather Chrome Stool Black is a luxurious item that will provide a striking look to any location, in addition to superb functionality. A prime example of modern sophistication, the Lush has a high-quality design that stands the test of time. 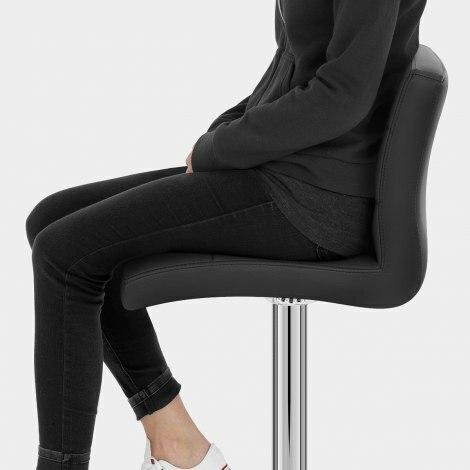 The copiously padded seat utilises high-density foam for exemplary comfort, with a high backrest that supports the user for a relaxing seating experience. The segmented stitched design of the seat catches the eye, all upholstered in genuine black leather, adding to the quality aesthetic. Weighing 18kg, its heavy nature makes it incredibly durable, with the chrome plated framework below showcasing a weighty, flat square base for excellent stability. A handcrafted rectangular footrest can be found on the central column, which houses the gas lift mechanism that provides variable height and 360 degree swivel. Completed by anti scratch floor pads beneath, the Lush is an opulent design that will not disappoint. "A great product from an excellent company"
We needed two kitchen stools to complement our new refurbed kitchen. The customer reviews on the product from Atlantic were very good which gave us the confidence to purchase. We were not disappointed - they are easy to assemble, look great, very sturdy, comfortable and functional. Wouldn't hesitate to recommend. What's not to like? Very handsome stools: the leather feels and looks good and the chrome is perfectly bright and shiny. Base plates are heavy and stools feel robust and well balanced, with easy to use gas lifts and low risk of tipping. Well worth the extra dosh. I recommend: pleased I bought this model. The website was clear and precise. Very easy to find what we wanted and to place an order. Free next day delivery which was brilliant. We were out when the delivery came but got an email to say that they would try and deliver again the next day within a certain hour long timeframe. The delivery arrived exactly as we were told and within the timeframe. 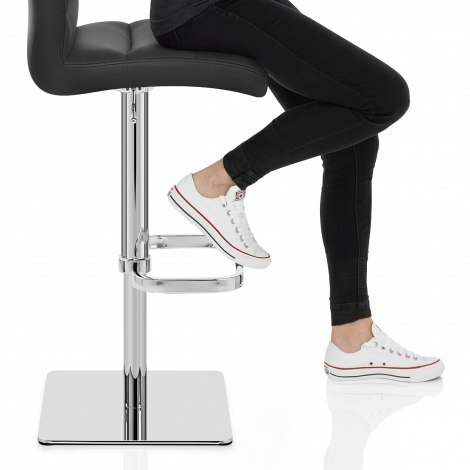 So impressed both with the company and with the quality of our bar stools. Would definitely recommend both the company and the bar stools. Very nice stool , fast delivery. Would recommend. We had bought some cheaper ones but they quickly got ruined. These are great stools and the leather makes the difference. You get what you pay for. Sturdy, heavy (in a good way) and comfortable.